In the past, when the Department for Sephardi Communities existed as a department within the World Zionist Organization, the Department was the operative arm, both in Israel and abroad, of the World Sephardi Federation and all the Sephardi communities in the world, and served the federation and these communities as a representative in the Zionist Executive and in the institutions of the Zionist Movement. This role is now carried out by the World Sephardi Federation, which maintains ongoing contact with the President of the World Sephardi Federation and its Treasurer. In February 1994, the Federation decided to transfer its World Secretary from Geneva to Jerusalem and to centralize in Israel most of the activity in order to bring more young people to Israel and to strengthen their Jewish Zionist identity within our communities. The budgets of the Federation and the Sephardi Federation are planned by the treasury of the World Federation, so as to enable a better administration of the funds and to direct the funds for activities abroad (towards Zionist educational activities among the young generation. The Federation participates is planning the programs of the various branches of the Federation in Israel and abroad, particularly in the area of activities for the young generation. It held Youth and Dor Haemshech Conventions for the young member of the Sephardi Communities in Latin America, in Montevideo, in Buenos Aires, and in Montreal. 155 young people from 10 Latin American countries participated in the convention held in July 1995 in Montevideo. In 1996, 120 young people participated in the youth convention held at the Bar Ilan University branch in Buenos Aires. In January 1999 a 10-day seminar was held for French leadership in Israel. A like seminar was also held in January 2000 with the aid of a KKL budget, and with the participation of 40 leaders. 1. In April , the World Sephardi Federation to6k the initiative of holding a first Convention of its kind in fo~er Soviet Union, in order to organize some activities within the Sephardi communities in this country. This convention took place in Baku, the capital of Azerbaijan. The theme of the convention was: The Caucasian Jews. It was attended by the Treasurer and the General Secretary of the W.S.F. This convention was also attended by eminent researchers from Israel, the United States, Russia and Azerbaijan. toured, in conjunction with the Jewish Agency, in a very special little town called Krashna Slovodan which to this day has kept its specific eastern Europe Jewish character with a most Jewish community and beautiful synagogues. 2. 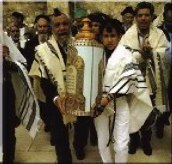 In October 2001, the inauguration ceremony of a new Sephardi Liturgical Center took place in Montreal (Canada). This Center was founded thanks to the initiative of the Canadian Sephardi Federation and, among others, to the support of the World Sephardi Federation. 3. In November 2001, took place in Montevideo, capital of Uruguay a most impressive Conference of Senior Representatives of FESELA, the Latin American Sephardi Federation. This conference was attended by the Treasurer and the General Secretary and enabled to discuss the problems of the Sephardi branches within Fesela. The participants discussed, in particular, the difficult situation of the Jews in Argentine. 4. The World Sephardi Federation mobilized itself at once when the financial crisis broke out in Argentina in order to help the needy families of Jewish Sephardi and oriental origin. The Federation allocated a budget of $ 10,000 which was transferred through its offices in Mexico and distributed to the families. The World Sephardi federation is in close contact with the leaders of FESELA in Argentina. Before the financial crisis broke out in Argentina, the W.S.F covered part of the costs of former President of the State of Israel, Itzhak Navon's visit in Argentina, organized by the Sephardi Federation in Argentina. 5. The French branch of the Sephardi Federation has organized during the current year several activities in particular in the field of social welfare and they donated funds for the organization of Bar-Mitzvah ceremonies for needy children. Also, encouraged by the W.S.F., the French branch has organized fund raising events in its clubs, for the benefit of needy children in Jerusalem.